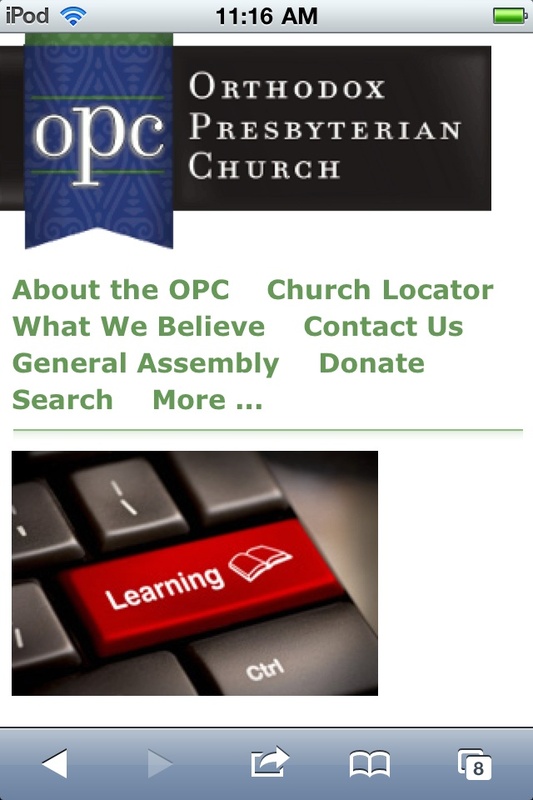 The OPC.org mobile site is now live! The OPC is the first of all the churches with which we have ecclesiastical relations to have a mobile site. What this means is that when you visit OPC.org from your mobile device or smart phone you will be automatically and seamlessly taken to a mobile-friendly index page. All the site's content will still be available to you, though presented in a linear (top to bottom) format that fits a small screen. If you wish to find a local congregation, read the daily devotional, check out a book review, search for a hymn in the original Trinity Hymnal, register for GA, or read complete issues of New Horizons or Ordained Servant, you can do it right on your mobile device. The appearance of the site on larger screens remains unchanged. This is quite an accomplishment for a small church. Even larger denominations such as the PCA, PCUSA, CRC and RCA do not have mobile sites. Please pass along the good news to church members and friends with mobile devices.